Note the shadow of the granite “aiguilles” on fresh early winter snow in the upper part of the glacier. The famous Aiguille de Midi is casting its shadow on the village of Chamonix on the top-left, as late autumn colours are still visible on the larch in Val Ferret in the bottom-right corner of the image. Contains Copernicus Sentinel data (2018). Processed with Sentinelflow (v0.1.3). Description by Julien Seguinot, as it first appeared on imaggeo.egu.eu. 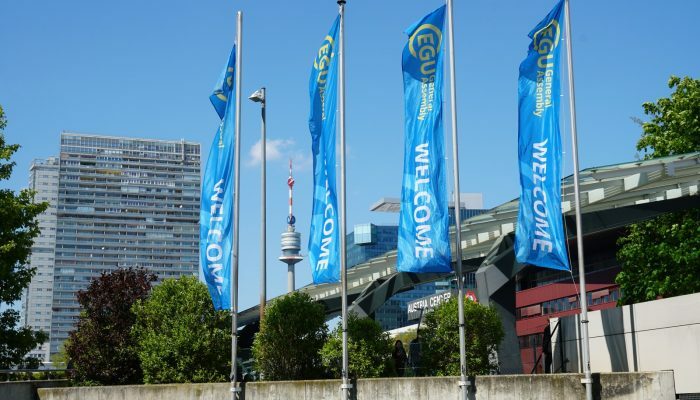 As well as a stimulating scientific programme, the upcoming EGU General Assembly will also feature several sessions and events that connect science, art and the public, as well as address how the geoscience community can help address major societal challenges. Read on for a sample of what to expect at this year’s EGU meeting, and of course, stay tuned to our social media channels and follow the official hashtag (#EGU19) for more information in the run-up to the conference. Communication between scientists, institutions, policymakers and the general public is widely recognised as an essential step towards a fair and sustainable society. The Science and Society session Science, Politics and European (dis)integration: A conversation of Geoscientists with Ilaria Capua and Mario Monti will focus on science and politics with a global perspective, and the impact of populism on European integrity and therefore scientific research. 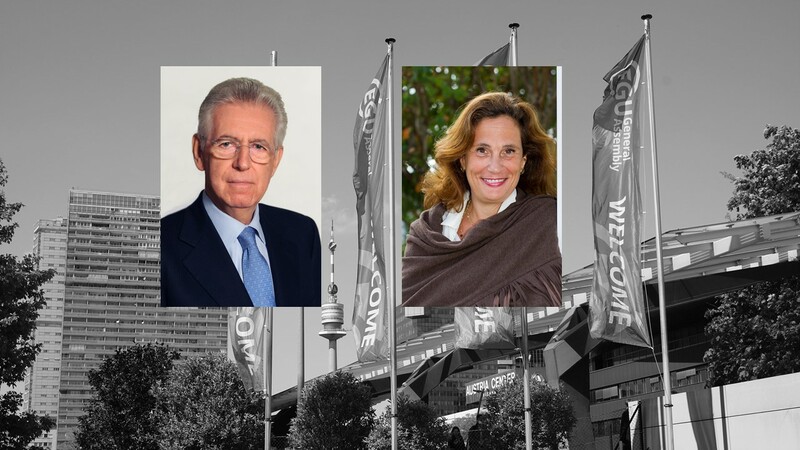 In this session, Former Italian Prime Minister and European Commissioner Mario Monti and Former Italian Parliamentarian Ilaria Capua will outline optimal strategies that researchers can use to deliver clear scientific messages to key institutions. Their presentations will be followed by a question and answer session with General Assembly participants. The EGU will welcome Ilaria Capua and Mario Monti at the 2019 General Assembly during the high-level Science, Politics and European (dis)integration session on Wednesday 10 April, 12:45–14:00 in room E1. Plastic pollution is recognised as one of the most serious and urgent problems facing our planet. There is a pressing need for global action, backed by sound scientific understanding, to tackle this problem. This additional Science and Society session, Plastics in the Hydrosphere: An urgent problem requiring global action, will address the problems posed to our planet by plastic pollution, and examine options for dealing with the threat. From Education and Outreach Sessions to short courses, there will be many other events at the EGU meeting dedicated to engaging the public and policymakers. The EGU office has selected a few, which you can find on the EGU website. At the 2019 EGU meeting, there will also be several opportunities to observe, discuss, and take part in activities focused on integrating art and science. As a repeat from last year’s General Assembly, the EGU will once again be hosting two artists in residence at the annual meeting. This year’s resident artists are Morgane Merlin, an environmental science PhD student and visual artist based in Alberta, Canada, and Giorgo Skretis, a visual artist and musician based in Chania, Greece. At the meeting, Merlin will focus on creating illustrations based on the main research results of selected presentations. Meanwhile Skretis will create a small collection of sculptures using natural materials such as clay and plaster. The form and manner of creation of these sculptures will reflect the various processes and forces of nature, with a focus on themes presented at the meeting. EGU General Assembly participants will be able to follow the art work produced by Merlin and Skretis via social media (using the hashtag #EGUart), through screens at the meeting, on the EGU blog GeoLog and live at the conference centre (in Foyer D in the Brown Level -2/basement). Also be sure to save some time in the evenings for some of the Science-Art-Public Events scheduled throughout the week! 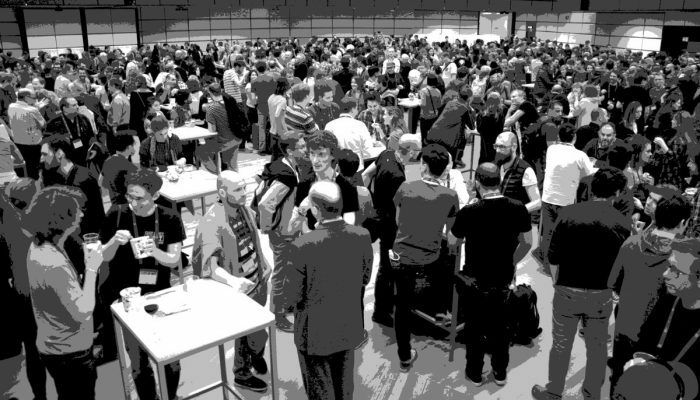 The #EGU19 Geoscience Games Night is set for Weds April 10th. We are so excited!!! The EGU General Assembly will take place from 07 to 12 April 2019 in Vienna, Austria. For the full session programme and more information on the General Assembly, see the EGU 2019 website and follow us on Twitter (#EGU19 is the official conference hashtag) and Facebook. The winter season is a good time to take advantage of cold weather activities, whether that’s hitting the ski slopes or warming up by a fire, but for Renato R. Colucci, it’s also one of the best time’s to study the Earth’s underground cryosphere. 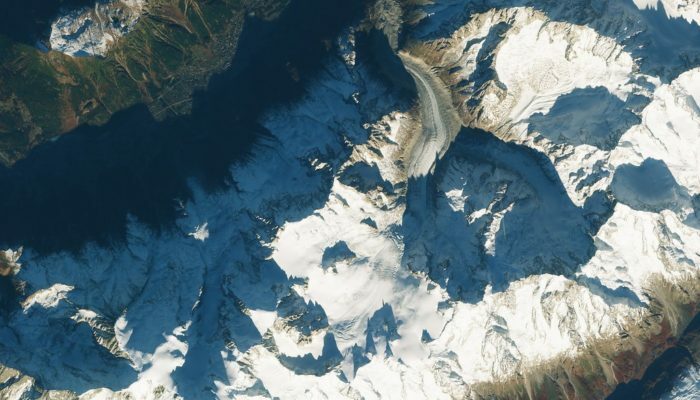 Colucci, who took this featured photograph, is a researcher at Italian Institute for Marine Sciences (ISMAR) of the National Research Council (CNR) and is a scientific lead partner for the Cave’s Cryosphere and Climate project, C3 for short. 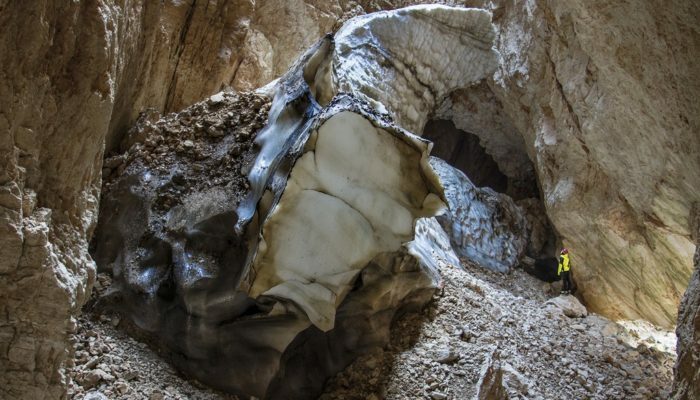 The C3 project aims to monitor, study, date, and model alpine ice cave environments. This photo was taken by Colucci while he and the C3 project team were surveying a large ice deposit in the Vasto cave, situated within the Southeastern Alps of Italy. Speleologists of the E. Boegan Cave Commission began documenting the caves in this region in the 1960s, making it a great site for studying underground cryosphere today. For the past few years the C3 team has been monitoring the microclimates of these caves as well as analysing how the ice masses within are melting and accumulating ice. There are many different kinds of ice deposits in caves, but the main difference is how these types accumulate their frozen mass. For some cave ice deposits, like the one featured in this photo, the snowfall that reaches the cave interior amasses over time into solid layers of ice, as is typical for many glaciers. However, other deposits take form when water from melting snow or rain percolates through rock’s voids and fractures, then freezes and accumulates into permanent ice bodies in caves. These high-altitude underground sources of ice are a lesser-known faction of the cryosphere since they are not very common or reachable to scientists, but still an important one. Often the permanent ice deposits in caves contain pivotal information on how Earth’s climate has evolved over time during the Holocene. However, if the Earth’s global temperatures keep increasing, this data might not be available in the future. While ice masses in caves are more resilient to climate change compared to their aboveground counterparts, many of these deposits, and the vital data they store, are melting away at an accelerating rate. “Global warming is rapidly destroying such important archives,” said Colucci. Through this project, the researchers involved hope to better understand the palaeoclimate information stored in these deposits and how the ice will respond to future climate change. A major re-organisation of the European Commission’s Research and Innovation Directorate General is scheduled to take place this year with a goal to revise staff reporting procedures and increased coordination between the agencies. While improved coordination may be of benefit in some areas, concerns have been raised about the potential impact these changes may have on the European Research Council (ERC), the European funding agency for excellence in research that sits within the Directorate but has the distinguishing feature of being independently managed by scientists. We believe this autonomy is a key and critical element of the undisputed success of the ERC, since its creation just over a decade ago. This success has been, in large part, due to the capacity of the agency to listen, act upon, and adjust to the needs of the scientific community. Without this close relationship with the research community, the ERC’s ability to support the very best frontier science will be compromised. Of particular concern, are potential changes in the remit of ERC’s Scientific Council as governing body, which is undoubtedly a cornerstone of the ERC’s credibility, success and international recognition. The EGU strongly supports the unique ability that the ERC currently has to respond directly and independently to the needs of the scientific community. Being the sole European funding agency for scientists, designed and governed by scientists, has enabled it to become one of the world’s leading and most respected funders of frontier research, with over 70% of completed projects leading to discoveries or major advances. The EGU unequivocally supports the Scientific Council’s ambitions for Horizon Europe to “consolidate the ERC’s success by ensuring its continuity, agility and scale-up in the next framework programme”. We encourage EGU members to react to this EGU response. If you have comments that you would like to see added to this piece, please email policy@egu.eu or add your comment on this blog post.